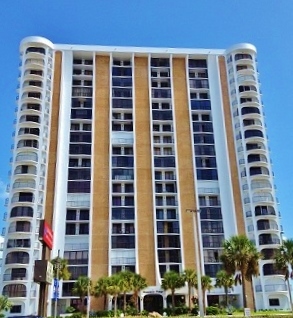 Oceans Four Condominium, known as the Queen of the Shores, has 20 stories and 114 units. The direct oceanfront complex is conveniently located in the heart of Daytona Beach Shores within walking distance to shopping, dining and banks. One unique characteristic includes units stretching the entire width of the building. This gives owners beautiful oceanviews from the living room balcony and kitchen to sun setting riverviews from the bedroom balcony. Semi private elevator brings you right to your door. One year minimum rental makes this complex ideal for a full time residence or second home. 2 pets up to 20 lbs is allowed.